ICL8038 is a monolithic waveform generator IC(ICL8038 pdf) that can produce sine, square and triangular waveforms with very little distortion. The frequency can be programmed from 0.001Hz to 300 KHz using external timing capacitor and resistor. Frequency modulation and sweeping can be attained by using an external voltage. Other features of the ICL8038 are high linearity, high level outputs, simultaneous sine, square, triangle wave outputs, low external parts count, high temperature stability etc.The working of ICL8038 is as follows. The external timing capacitor (C2 in the circuit diagram) is charged and discharged using two internal current sources. The first current source is on all the time and second current is switched ON and OFF using a flip-flop. Suppose the second current source is OFF and the first current source is ON, then the capacitor C2 will be charged with a continuous current (i) and the voltage across C2 increases linearly with time. When the voltage reaches 2/3 supply voltage, controlling flip flop is triggered and the first current source is activated. This current source carries double the current (2i) making the capacitor C2 is discharged with a current i and the voltage across it drops linearly with time. 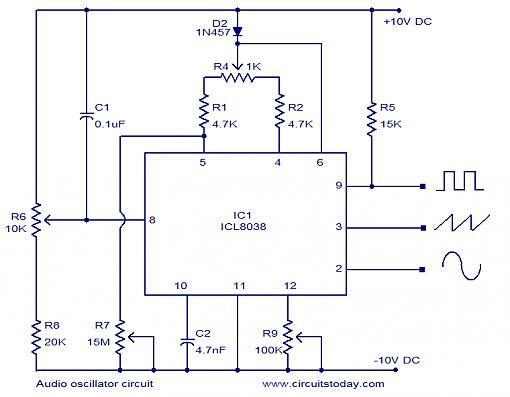 When this voltage reaches 1/3 supply voltage, the flip flop is resetted to the initial condition and the cycle is repeated again.Circuit diagram – ICL8038 audio oscillator. 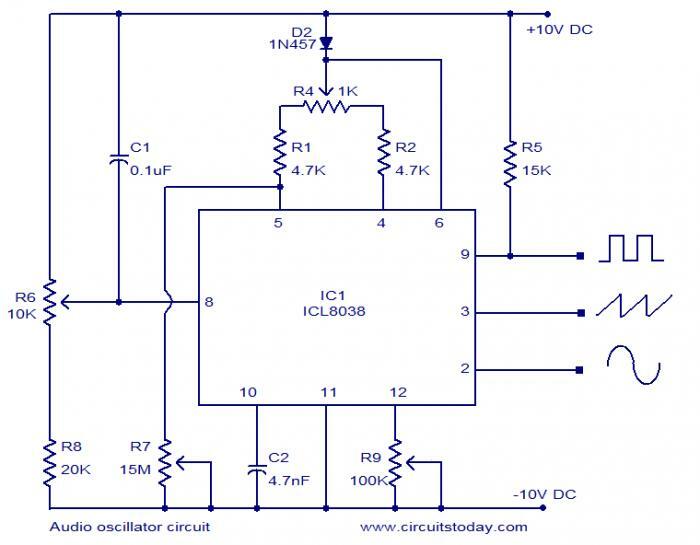 The circuit diagram given above shows a variable audio frequency oscillator using ICL8038. Such a circuit is very useful while testing audio related projects. The frequency range of this circuit is 20Hz to 20KHz. POT R6 can be used for adjusting the frequency while POT R9 can be used for adjusting the distortion. POT R4 can be used for adjusting the duty cycle while POT R7 can be used for nullifying the variations in duty cycle. C2 is the external timing capacitor and R5 is a pull up resistor.Notes. All fixed resistors are rated ¼ W.
Looking at this circuit I see there are are at least 3 problems:1 I assume the supply is +10v-0v–10v, where then is the 0v connected?